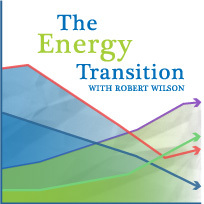 This is the first column in The Energy Transition series by Robert Wilson. This series, exclusive to theenergycollective.com, will take a critical look at the prospects of a transition away from fossil fuels, and promises to abide by the advice of Richard Feynman that reality must take precedence over public relations. The twenty first century will almost certainly witness a transition to an overwhelming urban human population, and hopefully a transition to a low carbon energy system. The former however will have a significant impact on the latter, because a fundamentally urban species cannot be powered locally. The continued, and essentially unabated, accumulation of carbon dioxide in the atmosphere may at times make considerations of the requirements of a de-carbonised energy system appear somewhat self indulgent, but I must ask the reader to indulge me, and at a little length. What would a low carbon energy system look like? (And let’s avoid such fanciful ideas as “zero carbon,” because that would be truly self indulgent.) In essence we would get as much electricity as possible from some combination of renewable and nuclear energy, and electrify as many aspects of our energy systems as is feasible. Predicting the relative composition of such a system is a largely fruitless exercise. However, we can say something about the extent to which it a low carbon energy system will be distributed and “local”. This confidence comes from the difference between the high physical concentrate of energy use in cities, and the relatively low physical concentration of renewable energy resources. There are fundamental physical limits to how much energy we can extract from renewable resources for a given area of land. If we want to rigorously quantify this we calculate an energy source’s power density in watts per square metre (W/m2 ). To get an understanding of this concept consider the recently opened London Array wind farm to the south of England.This is the world’s largest offshore wind farm and according to its owners will generate “enough energy to power nearly half a million homes.” Its total capacity is 630 MW covering a total of 100 km2, and is expected to have a capacity factor of 39%. In other words the power density of the London Array will be 2.5 W/m2. This number is also very similar to the average calculated by David MacKay for existing UK wind farms. The United Kingdom is windier than a lot of the world, and some research suggests that large extraction wind farms will reduce average power density closer to 1 W/m2, so 2-3 W/m2 can be viewed as an upper limit on the power density of large scale wind power. This power density reflects average output, however peak power density of wind farms will be perhaps three times higher, and minimum power density will be close to zero. And it should be noted that it excludes the requirements for manufacturing steel required for turbine towers and the extraction of fossil fuels for conversion to plastics for wind turbine blades. However inclusion of these factors is not likely to result in a significant reduction to power density estimates. Globally solar radiation available for conversion to electricity averages 170 W/m2, and in sunnier locations it can reach above 200 W/m2. This solar energy however is currently not converted at anywhere close to 100% efficiency. Commercial solar photovoltaic panels typically average between 10 and 15% efficiency. Power density of solar installations must also account for space between panels, either for servicing in solar farms or for spacing between houses in rooftop solar installation. As a result the highest power density achieved is around 20 W/m2 in desert solar PV farms, whereas solar farms in Germany generally achieve 5 W/m2. Future improvements in panel production will hopefully see significant improvements in panel efficiency. However there will remain a firm physical upper limit of 200 W/m2, which will be significantly lower when only considering large scale deployment of residential rooftop solar, due to obvious physical restrictions on panel placement. At their best biofuels might be able to produce close to 2 W/m2. However power densities of 0.5 W/m2 and below are more typical, with prominent examples of this being corn ethanol for transport and the burning wood for electricity. We will see later that this is a very important consideration for the scalability and sustainability of biofuels. In contrast typical generation of fossil fuel and nuclear electricity has a power density of at least an order of magnitude greater than that of renewable energy. Power densities are comfortably above 100 W/m2 after accounting for mining etc. And conventional power plants often have power densites in excess of 1000 W/m2. A simple example of this higher power density is this small propane powered generator, providing in excess of 1000 W/m2. This is far in excess of the power density of any conceivable new method of generating renewable energy. A simple thought experiment can demonstrate why power density needs to be a fundamental consideration when evaluating renewable energy. Here it is: Imagine a world where all energy comes from bio-energy. What would be the requirements? 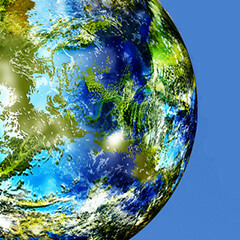 Currently the planet consumes energy at a rate of over 16 TW (16 trillion watts). If we include non-commercial biomass energy used in Africa and Asia, an uncertain figure, this number would increase. However for simplicity I will ignore non-commercial sources and will round our figure down to 15 TW. If we got all energy from corn ethanol we would need to convert a total of 75 million km2 to corn ethanol plantations. This is roughly half of the land surface of the entire planet, land which is somehat scarce. So this simple thought experiment shows there very real limits on how much energy we can, and should, get from biofuels. If we want large scale biofuels to become truly sustainable, a questionable prospect, we will need to see significant improvements to their power density, perhaps improvements of at least an order of magnitude. How much energy do we consume per unit of land? For ease of comparison this figure again can be calculated in W/m2. On a global level this is 0.1 W/m2, if we only consider land surface area. Global averages however are not very instructive, power density averaged at the scale of countries and cities is much more important. David MacKay has visualised this much better than I can in his “Map of the World.” Here is the average rate at which countries consume energy, in W/m2, compared with the power density of different renewables: Ideally a country wants to have lots of available land for renewable energy, i.e. they want to be in the bottom left of this graph. Being in the top right however may lead to some problems. Consider first the United Kingdom and Germany. Both use energy at a rate of just over 1 W/m2. So a back of the envelope calculation will tell you that getting all of their energy needs from onshore wind will require covering half of the UK or Germany in wind turbines. If you have ever been confused by why these countries are building wind farms in the North Sea, instead of on land where it is much cheaper, now you know why. Wind energy’s low power density means you need to put it in a lot of back yards. And there are not as many of them in the North Sea. Things are even worse in Japan and South Korea. If you covered all of South Korea in wind turbines they would generate less energy than is consumed there. Japan has a similar problem. And this ignores another difficulty: trees. Both Japan (68%) and South Korea (63%) have very high forest cover. If we ignore forested land (which should be out of bounds for large scale renewable energy generation, unless large scale biomass plantations are deemed acceptable) energy is used with a power density of almost 6 W/m2 in Japan and 7.5 W/m2 in South Korea. This calculation makes it clear that these countries can only be predominantly powered by renewable energy through the large scale utilisation of the more power dense solar energy. And social and political constraints may mean this can only happen if the efficiency of typical solar panels increases significantly from their current 10-15%. Some people may like the idea of running Tokyo on local renewable energy. They will have some difficulty actually doing it, and that’s putting it mildly. Since 2008 the majority of humanity live in cities. And by 2050 it is probable that we will see seventy or eight percent of humanity living in cities. The key energy challenge this century will be providing energy for these cities, and quite clearly local distributed energy is not a solution. To see why this is the case requires untangling some issues. Here are some considerations. An average North American has an annual energy consumption of just over 7 tonnes of oil equivalent (toe)., which is the equivalent of a rate of 9,000 watts. However, this is almost double what it is in countries such as Germany, France and Japan. A comparison of these countries in terms of key well being measures makes one thing clear: there is no evidence that North Americans have greater well being as a result of their excessive energy use. Americans don’t live longer, aren’t healthier, or better educated than countries that consume half as much energy per capita. That this high per capita energy consumption comes with a very significant environmental cost – global carbon dioxide emissions would drop by almost 10% if North Americans consumed like Europeans – but little gain in terms of human well being, suggests that is is not desirable for other countries to emulate North American consumption patterns. 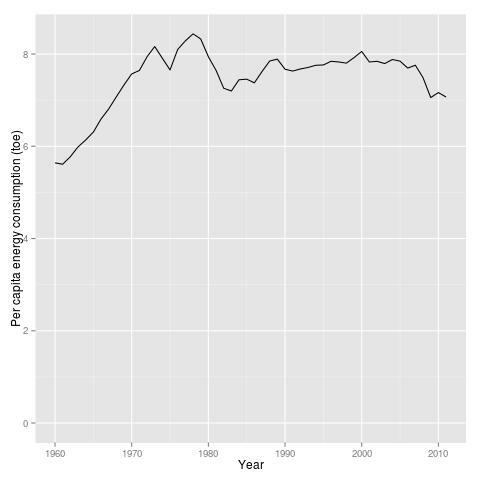 The United States saw peak per capita consumption in the 1970s, with consumption now seeing an apparent decline. 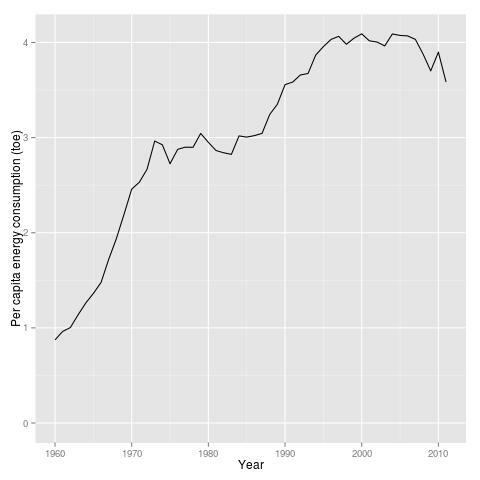 And the fact that per capita consumption did not rise in the age of the Hummer suggests significant room for movement. 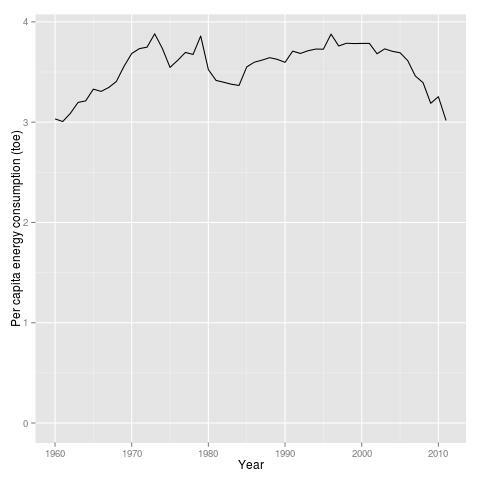 Germany is also now seeing declines in per capita consumption. So, many modernised countries are now seeing reductions in per capita energy consumption, and this is not being accompanied by a reduction in quality of living. Any sensible long term energy and climate policy should include a strong desire to continue this trend. The belief that the world can transition to both American levels of energy consumption and to a low carbon energy system by the middle of this century ignores the vital lessons of previous energy transitions, and given the current position of renewable and nuclear energy it appears delusional. The world therefore must be much more like Japan than America. And cities must play a key role in reducing energy consumption. The most important and effective way to do this is simple: make them dense. For a full elucidation of why, I recommend books by Edward Glaeser and David Owen. But the key reasons are easy to understand: a dense city lets you walk or take public transport instead of drive and it lets you live in a more energy efficient apartment building instead of a large inefficient house. Packing people more tightly together in cities may not be to the taste of everyone, but it appears to be one of the most achievable and practical ways to reduce how much energy people consume. Let us now move forward to 2050, and the world is as I hope it will be. Global population will have peaked below 9 billion as a result of the spread of the demographic transition to modernising countries, and the success in reducing infant mortality and widespread availability of contraception. Perhaps 7 billion of us will live in cities, and they will consume much more like modern day Japanese than Americans. How will we provide energy for these cities? The answer appears to be large, centralised power plants, whether they are wind, solar or nuclear. Here I assume, wishfully, that we have managed to get rid of fossil fuels, an unlikely prospect. The answer however is almost certainly not local distributed energy, and for simple reasons. A typical block in Manhattan consumes energy at a rate of over 1,000 kWh per square metre each year, a power density of over 100 W/m2. This is almost two orders of magnitude greater than the power density of wind power, and obviously you could not plaster Manhattan in wind turbines. Solar power is not much better. Imagine that we could cover 20% of Manhattan in solar panels. This would give us no better than 5 W/m2. Clearly Manhattan is not getting its energy locally. And as you can see from the above map the other boroughs of New York are not going to fare much better. Low density Phoenix perhaps has a shot at getting most of its energy from solar power. Covering 25% of Phoenix in solar panels would produce as much energy as is consumed in Phoenix. The practicality of this is of course rather questionable, and getting more than 50% of Phoenix’s energy from local solar will require something that currently does not exist: a cheap way to store energy on a large scale. A system involving more than 50% of energy coming from solar will thus inevitably require the accounting of land requirements for large scale storage, an uncertain prospect, and significant losses of solar panel output due to efficiency losses during storage and curtailment of excess. The prospects of American cities running largely on local renewables thus seems unlikely, and 83% of Americans live in cities. Before asking if these cities can run on local renewables I must first mention the too real disparities in global energy consumption. 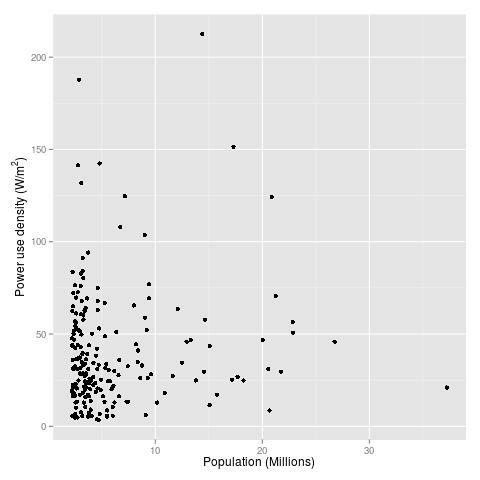 Below is a comparison of the population of countries with their per capita energy consumption, with population plotted on a logarithmic scale due to China and India being much larger than other countries. 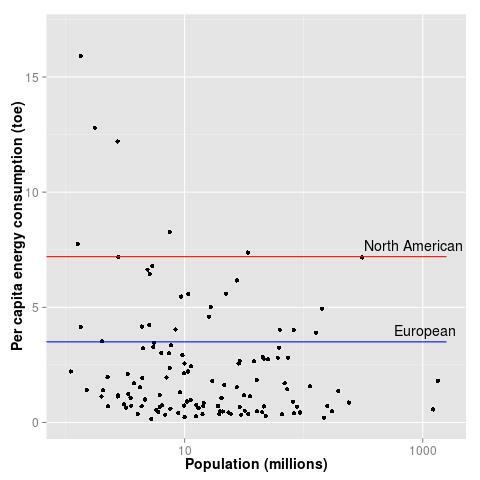 And I include lines showing typical European and North American per capita energy consumption. While there are about 350 million North Americans who can, and should, reduce their energy consumption to European levels, there are even more at the bottom who must increase their energy consumption significantly to improve their quality of life. Quantitative comparisons are sobering. Over 35 countries have per capita consumption at less than 10% of North American levels, with populations totalling over 2 billion. Despite the apparent desires of some environmental NGOs (for an example see page 11 of this WWF report) it is therefore undesirable to propose reductions in global energy consumption. The modernised world may consume excessive energy, but energy consumption is much too low in modernising countries to let us decrease global energy consumption without negative humanitarian impacts. We therefore should have a desire to both reduce excessive consumption in modernised countries and increase energy consumption in modernising countries. I am not going to suggest a prescriptive end point. Instead I will assume that consumption levels in modern day Japan can provide a very good quality of life, and exceeding these levels is unnecessary. 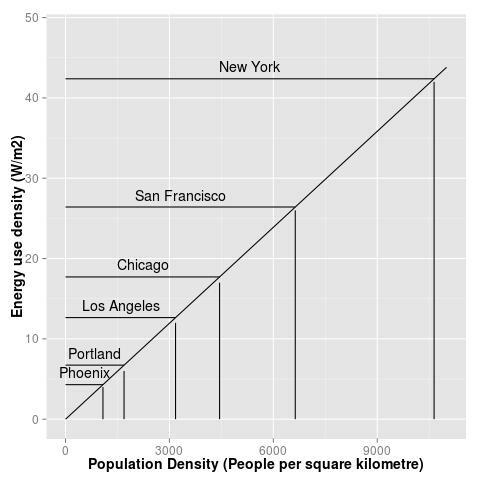 In total 10 cities would have power density greater than 100 W/m2, 56 would have power density greater than 50 W/m2, while 181 would have power density of over 10 W/m2. That is 90% of the planet’s 200 largest cities almost certainly cannot be powered predominantly by local renewable energy. The population densities of these cities are not significantly different than the rest of the world’s cities, so we can conclude that the the vast majority of cities cannot be powered by local renewables. And this suggests very serious limits to the role of local distributed energy in a world where more than 70% of us will probably live in cities. The prospects are even worse in individual countries. Of the world’s 200 largest urban areas, 17 are in India. Below I have isolated these cities. 120 million people live in these cities. Covering any of them entirely in 10% efficient solar panels will generate less than half of their energy needs. And look at that dot in the top right, that is Bombay. For Bombay to get all of its energy needs from solar in my hypothetical future it would need to harness almost 100% of the solar radiation that strikes it, a remote prospect. This extremely high population density is routinely ignored by western environmentalists calling for distributed energy to be the solution to India’s energy problems. It quite clearly is not. 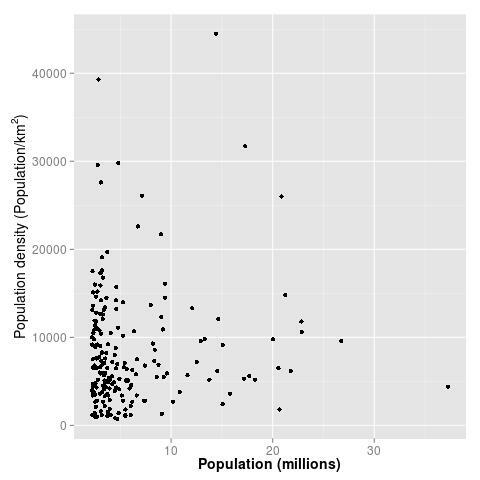 In this century the bulk of humanity will live in large densely populated cities. If the citizens of of these cities are to attain a high quality of life they will require large centralised energy generation. This is not a matter of ideological preference, but of engineering reality. We need to get a grip on what’s possible and what’s not. Though unsettling, only a plain assessment of the facts will help us chart a course through what will likely be the most difficult period in the whole of human existence. With all due respect your idea is at best at the conceptual stage so is certainly not available. As I pointed out for your one example, the heat exchangers size is enormous. But lets not get inot a discussion on your proposal here. I agree with the thrust of your argument and it is well laid out rgument against local production as the basis of our energy needs. Do you have any view as to how much local energy could be useful. If we take the assumption for example that the amount of private automobiles in say the Spain does not increase and we do convert to electric driving, should cars be sold with say a solar charging station? Of course size would be important here. Mr. Wilson is a true David MacKay fanboy. This post follows Mr. MacKays line of thought letter by letter. This includes mixing scientific facts & reasonable outlooks with the very dominate urge to ignore both the current state of technology/reality and the pro-renewable energy system conclusions. For example Robert (aswell as MacKay) are well aware that the per capita energy consumption will (have to) decline moving forward. However, both gentlemen choose not to run their little number games based on this prospect. In his book “Sustainable Energy – Without the Hot Air” MacKay finally reached the conclusion that the future energy needs would/could be more like 70 kWh / person / day instead of the current 125 kWh. This is not new nor breathtaking information, since I know no renewable energy scenario that tries to meet todays primary energy demand with biomass. That 70 kWh number (like most things in the book) was a simplistic ballpark estimate based on theoretical analysis instead of detailed scientific research. German researchers have already conducted several generations of detailed studies into efficiency & conservation possibilities. These studies include systemic analysis & simulations and come to the conlusion that reducing the consumption to 45-55 kWh/day/person is possible/likly/neccessary. For the most part many of the consumption reductions are simply a direct result of transitioning away from inefficient fossil fuel combustion. Electric motors are significantly more efficent than combustion engines, heatpumps multiply 1kWh of electricity into 2-3 kWh of thermal final energy. When one plays Wilsons/MacKays little number games based on these facts it’s very hard not to see the renewable energy option as a viable option. Unfortunatly – as I have mentioned before- they choose not to connect those dots. My guess is: The energy debate in the UK is 20 years backwards. Before saying what I wrote is “utter nonsense” how about trying to read it. I did not say once in this piece that renewables are unsuitable for a future urban society, and anyone capable of reading should have realised that. The only thing that is obvious here is that you have not read a word of what I wrote before commenting. Please don’t waste my time in future. The difficulty with electric cars is that a lot of people take them to work during the week. Factories have very high power densities, so solar charging there is a non-starter. Offices are also quite power dense. I’m not aware of any estimates of local energy on a global level. Analysis shows it will be much less than 50%. Exact figures probably cannot be worked out because we don’t really know how much of a city you can cover in solar panels. Could you convert Central Park in New York into a solar farm? (clearly not). Like other commenters I’m really not sure if you got what the piece was saying. I am not somehow holding renewables to a different standard than fossil fuels. That section is clearly about the limits of “local” renewables, not about renewables in general. I have read your article – and I actually enjoyed it, but there are things that bug me. I must confess, I have a certain hate-love for what you (and David MacKay) are putting out there. And I also don’t get why you seem to argue against the “Renewable Advocates Don’t Do the Math”-Strawman. The math of MacKays book -aswell as several detailed studies- show that a 100% renewable energy system is possible here in Germany, aswell as in the UK – while using less than 10% of the land area. Unfortunatly you don’t like responding to my statements, which is a pitty. I did not say “Renewables can not be enough” in the post. Either read my articles or don’t comment on them. You repeat this point alot, despite knowing that future energy needs will be very different than todays primary energy consumption and the obvious fact that all our debates/discourse is about the demands of the future energy system, not the present/past. In addion you choose to ingore the very fact that the current generation of wind turbines has a hubheight of 120m, which allows them to tap into much stronger winds. The technology is not standing still (increasing capacity factors) and the rules of phsyics do apply to the UK aswell. I certainly agree that our energy use will have to become sustainable, and as of today sustainable energy costs more than fossil fuel, and more expensive energy will probably lead to reduced per capita consumption, but not necessarily (see Jevon’s paradox which says consumption can go up in response to efficiency improvements). For the right price, surely even Germany could line up adequate supplies of renewable energy imports. Regardless of which energy resources are politically popular today, our decendents (including city dwellers and isolationists) will always have the option of leading energy-rich lives using the Earth’s inexhaustible uranium and thorium resources. These energetic elements occur widely in nature, and they both radiate their secret to any who will listen. I am afraid his article doesn’t demonstrate this at all – the fact that it implys this conclusion is exactly what bugs me about it. The first part of the article showcases that it would be very difficult to meet todays primary energy needs with old renewable energy technology. Since nobody (not even Robert or MacKay) wants to do this, it’s a fruitless excersie when discussing the future of energy – it is however a valid point when addressing folks who say “lets just switch to biofuels”, but I’ve never met such people. I’ve read alot renewable energy scenarios and it’s simply clear that the current primary energy demand is not a good basis for assertions of our future energy demand. I don’t have much beef with the second part – though I think he uses the words “centralized power plants” and “local” in a strange way. As some other readers have pointed out, urban areas will gain the ability to supply a significant share of their energy needs with sustainable energy technologies for the first time in history. Indeed but your idea is more akin to a reserve as to actually being availalbe as you put it.The resource has not be technically proven to be recoverable. The graphic is very useful but the different sectors of the energy movement could actually use some terms from the oil industry. Most of the solar circle (for example) shown there is what I call a reserve or at best a technically recoverable resource. However considering the massive scaleup even to recover some of that energy, one cannot say that it is an economically recoverable resource. Indeed multiple technical barriers exist such as scaling up of production of the metals or even of solar collectors. Now what Robert is trying to do in my opinion is to put that reserve for a certain area like Japan/large city into context and show that even if the total reserve for that area could be extracted using a guide figure as to our current technical limits (McKay), it would still not be enough. Thus the arguments that many renewable advocates come up with regarding locally produced energy being the key to our situation are shown to have a weak basis. The distinction between a reserve and what is recoverable is sorely needed. I would rather debate things like Immaculate Conception, but anyway. Look, if the UK can get 5-6 W/m2 then why not tell this to the people who own the London Array. As I show in the article this is expected to get 2.5 W/m2. Are the people who designed this 100 square kilometre wind farm idiots? I guess if you were their chief (armchair) engineer the wind farm would cover less than 50 square kilometre and could generate the same amount of energy. 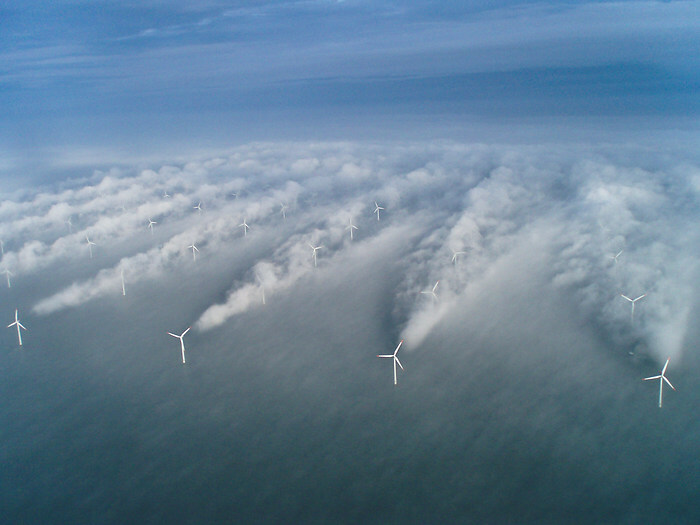 And this is the same for any proposed offshore wind farm that I have seen. Either you are wrong, or people have stupidly invested billions of pounds in offshore wind farms that should be too times smaller. Robert, your entire case is build on a theorethical / mathematical approach. You use the correct formulars to figure out the theorethical POWER PER UNIT AREA of a windfarm / windturbine. I can respect that approach, since we could actually have a wonderful proper debate on that basis. Unfortunatly you choose to refuse the fact that a power density of 2 W/m² is only one particular result for a distinct set of preconditions. To be precise an average windspeed of 6 m/s [a variable that has significant influence on the result – v³ (!)] and the land area per windmill [ (5d)²]. Both values are not god given and they are by far not the norm for todays wind energy utilization. Average windspeeds of 7-9 m/s are not uncommon around the world and in case of land based windfarms the land area per windmill is usually 5d x 3d. If you are honest about your scientific/arithmetical approach you could fill the formular from MacKays book with those real world value and do the math. I did just that and I get a power density of 8.71 W/m² for an average windspeed of 8 m/s and a capacity factor of 50% and 6.1 W/m² for a capacity factor of 35%. I know you think you are really clever by bringing up the London Array to proof your point, but that is not how science works. I am sure you can find many examples among existing windfarms that fit your arbitary 2.5 W/m² threshold, but that is no scientific proof for your theory that it’s a theorethical maxima. However, one single example that proofs this 2.5 W/m² value to be not universal is proof enough. So please play the number game with the Alpha Ventus offshore windfarm. It produced 267 GWh in 2011 on a landarea of 3.84 km². That’s 6.95 W/m². I certainly don’t think they are idiots, but I don’t think a high W/m² value is the only concern when building an offshore wind farm. I am not familiar with the detailed aspects of offshore windfarm planing, but I can think of dozens of reasons why you could require additional spacing between turbines. There might be regulartory and technical restrains influence spacing between turbines that have nothing to do with maximizing the energy yield. Perhaps shipping lanes require additional spacing or more maneuvering-space is required during construction… perhaps additional spacing is needed to allow maintainance from air. I would caution you not to proof your theorethical point with real world example you don’t understand. That’s pretty noob-ish, stick to your strenght. Modern windpower can get 2.5-5 W/m² in Germany. And we will need 2.5 W / capita – a significant portion of which will be in the form of electricity. This discussion is tiring me out. As I told you before MacKay’s figure of 2.5 W/m2 is based on an analysis of existing UK wind farms it is not purely based on theoretical considerations. My figure for the power density of wind farms is in line with mainstream estimates. Yours are simply based on your own innumerate calculations. I really don’t see the point discussing this further, I might as well argue with someone over whether 1+1 =3. Man, I feel the exact same way about you. MacKays book clearly states “2W/m² at 6m/s (! )” for a simplified (5d)² turbine area at a capacity factor of 50%. That’s not an axiom. I gave you the example of the Alpha Ventus Wind Farm, which clearly surpasses the 2.5W/m² – even when considering the (6d)² spacing of the turbines it’s well over 2.5 W/m². I am loosing the respect I had for you. I thought you would at least base your opinions on science instead of fiction that suites your imagination. I guess I was wrong. This is tiring me out. An a previous conversation I linked to a scientific paper discussing the literature on power density. None of the research suggests 6-7 W/m2 is plausible. You also repeatedly say David MacKay’s numbers are based on theoretical arguments. Yet when I tell you he has estimated mean power density for UK wind farms at just over 2 W/m2, you simply ignore it and return to babbling about MacKay’s theoretical arguments. So, I provide you with MacKay’s analysis of average power density for UK wind farms, and you respond with your own *incorrectly* calculated power density for a cherry picked wind farm. Nathan, although I would not think of challenging the accuracy of MacKays’s contention that energy falling on half the Sahara is on par with global energy consumption, making this energy useful on a global scale is for all practical purposes impossible. I’ve done the math many times on PV solar. Depending on some assumptions, and mine are generally conservative, it would take carpeting about 1/3 of Arizona and cost $500 trillion to erect PV panels which could provide enough averaged power to supply the United States alone. This does not take into consideration any infrastructure or storage, and is based on current prices and capacity factors. With developing countries adamantly opposed to carbon controls at the expense of growth, global power needs will be expanding rapidly. Solar, wind, tidal, etc. are insignificant and quickly getting more so, and would not even be an issue were they not actually making our carbon problem worse, and removing focus from a rapid buildout of nuclear – our only hope for getting a handle on climate change. So, clearly my article is not saying Bombay cannot be powered by solar power placed outside Bombay. The problem with solar is not the land area required, note that we dedicated something like 1/3 the land area of the entire country to making food; energy is the next most important thing. The problem is cost. CSP with storage is about double the initial cost of nuclear, and due to the long life of nuclear plants, the gap increases over time. If you start with PV, the situation is worse, since the initial cost is still high, plus you guarantee fossile fuel lock-in, since the hoped-for (and required) breakthrough in batteries is unlikely to happen, so capacity factors will stay low. 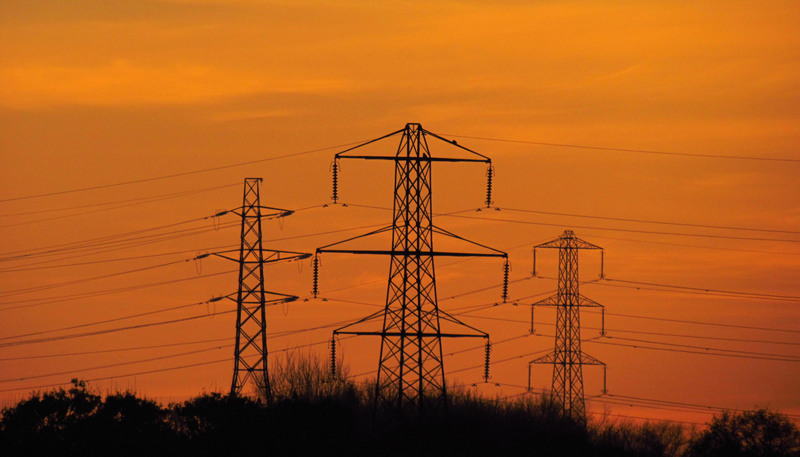 What has to be taken into account too are losses associated with transmission and storage. The low power density of renewable energy resources necessitates long transmission lines to connect urban centres to regions with good wind or solar resources. And then, there’s the problem of storage. If we want to reduce greenhouse gas emissions to safe levels by the middle of this century, we can’t afford to stick to the burning of fossil fuels even as a backup for variable renewables. Getting 50% of our electricity from wind or solar and the rest from natural gas still leads to emissions in the 200g CO2 / kWh range for the overall power system, which is way too high. The problem with large-scale storage is that it’s terribly inefficient. Since the pumped-storage potential is very limited in most countries and batteries are not up to the task, the only option we have left is hydrogen. And the round-trip efficiency of using electricity to produce hydrogen gas and then burn the hydrogen gas again to produce electricity is what, 30% to 40% at best? Transmission losses and inefficiencies in electricity storage will require a significant overbuild in renewable generating capacity. I don’t really see how the all-renewable option can outcompete nuclear under these circumstances. An all-renewable energy system seems to be a luxury option for countries with the appropriate geography. I have a hard time seeing how countries like Germany or Japan could pull off 100% renewables without a high fraction of imports. Another point: What most studies on the feasability of a large share of renewables in the power system focus on is the provision of 80-100% renewable electricity. That is also the stated goal of the German energy transition. For full sustainability however, you have to provide your entire energy demand (electricity, heat and fuels) from sustainable sources. I can’t see how this can be accomplished without the addition of nuclear to the mix. $500,000,000,000,000.00 !! Wow, that’s quite a scary price tag. Are we buying solar panels from 1975 at full retail from Home Depot? Shouldn’t someone tell them that what they are doing is just not possible, Mr Wilson? Why is it that so many people are so willing to use the word “never” when it comes to human ingenuity? We pump over 30 billion tonnes of CO2 into the atmosphere each year. I find it highly unlikely that this, so far essentially untested, “negative” emissions technology can be scaled up to make much of a difference to this. If we want to know if something is scalable we will at least need to know how cost effective it is, and this we don’t even know that for this technique. Instead of a rambling anti-renewables rant, perhaps you could say something about the contents of my article. I don’t think anyone is going to be convinced by you just saying renewables “don’t work,” and leaving it at that. The piece is about power density. Please try to keep it on topic. The piece is about the power density of renewable energy. The reason I left out the things you mention is that they have more or less nothing to do with the subject. So please in future comment about the actual pieces. And if you are going to plug something you have written, at least plug something that is relevant. So we’ve gone from fanciful and self-indulgent to possible, but highly unlikely. I think that’s a fair definition of progress. You’re wrong, Robert, it is not untested. It was tested and it worked… on a very small scale to be sure, but it worked. Scaling up ANY source of energy, regardless of form, in time to address climate change is undoubtedly going to prove problematic. But think of the implications of this technology. Yes, over a relatively short timeframe we have (unintentionally) pumped a lot of of CO2 into the atmosphere. This is now causing us problems. But using the sun’s energy, plant life (also unintentionally) pulls a lot of CO2 from the atmosphere each year to create energy for growth. Might it be possible to intentionally reverse what we have done and reduce atmospheric CO2, avoiding catastrophe, by using the energy of the sun? Isn’t this a far more worthy goal than any other energy sources could offer? I explained in the article, at some length, why I think power density matters. All I can do is ask that you actually read it instead of asking me to explain to you in the comments why power density matters. I have a system design that uses wind and wave (or any other) to hydrogen and compressed air. This system would be green in the extreme, with negative carbon, I believe. We could model it (the tripe system www.environmentalfisherman.com), but the numbers have not been modeled up as of yet. Using a wind and wave to hydrogen and CAES scenario, energy densities become factors only limited to the smart grid realm. My system designs are not in the electric grid frame, as you are so locked into. Electric grid inputs have had little and small gains with all the decentralized toys which is why I think I share your tendancy towards centralized systems. Energy must not be ignorantly seen only as electrical. There are so many forms of energy. We have self limited to the (electric smart) grid based thinking. Hydrogen can be manufactured with wind and wave hybrids of my design, far offshore, and cities can use this in low pressure low density, but yet high volume forms. Compressed air can power air conditioning and refrigeration, all from renewables. Why put energy toys in the city? I think I agree with you if you are maintaining that centralized plants work out better. But I do feel your discussion is limited to only electrical forms of energy, that is smart grid centered thinking? Is this correct? This is a question. Is your thinking electric based? Strikes me that a related parallel solution is to become more efficient at producing and using energy. As I understand your analysis, I believe that should yield a better power density, although I am uncertain as to what the correlation might look like. Might be an interesting adjunct article along the lines of producing power 10% more efficiently yields (?). Ditto for using energy 10% more efficiently. I realize this really does not have much impact on renewable energy because of the poor energy densities, but does have bearing on the Future of Energy. Stephen, that’s very interesting. But technical possibility is a long way from commercial feasibility. The obvious goal is to develop the least expensive, most abundant and safe low carbon source which can be stored and distributed at the speed of light. It seems that Concentrated Solar thermal Power, wind and pumped hydro, and the Molten Salt Reactor are the only concepts that have the potential to power over 10 billion people at a reasonable western standard. If I was able to do the cost calculations on these “big three”, assuming each can become mass produced in a modular manner, and considering safety regulations, fines, permits, fees, environmental restrictions, land aquisition challenges, taxes etc, I would intuitively know that the most power dense option would be the least expensive, and have the most potential. Given the current state of the global nuclear industry it seems rather fanciful to imagine we will have advanced nuclear producing electricity any time soon, let alone desilinating water or making “truly carbon neutral fuels,” whatever they are. When exactly do you imagine we will have excess nuclear power for these things? This sounds more like wishful thinking than serious analysis. I don’t care too much about what you, me or anyone else knows intuitively. When most of the people DEMAND it! Yes, it is possible, but not necessarily by use of the conventional, high pressure, social tainted, water core cooled reactors (LWR, PWR or BWR). Only a meltdown proof deactor design will permeate the hardest of challenges… social acceptance, and that reactor design is called the molten salt reactor or liquid fluoride thorium reactor (SMR, LFTR or similar). Great post. Looking forward to more in this series. I plan to look at that issue in more depth in a future post. 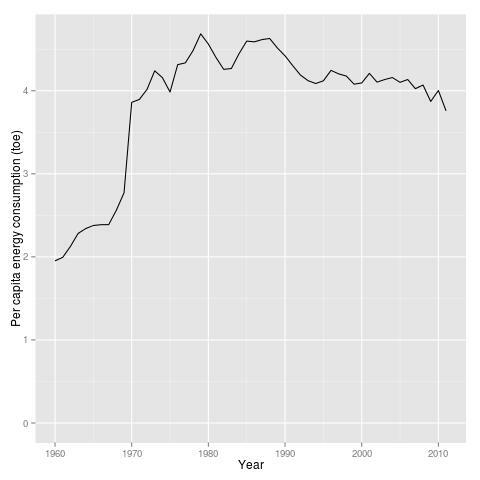 However there hasn’t been an increasing trend in per capita consumption in most modernised countries since before the recession, so I don’t think “may increase again” is correct. The question more likely should be whether they will just remain flat. Robert, completely missing from your piece are any references to the new energy technologies such as LENR (Low Energy Nuclear Reactions), ZPE (Zero Point Energy) Vacuum Energy etc. Several of these devices are currently available, and have a power density of at least a magnitude above the conventional and renewable sources. Besides, they have zero emissions and no ionizing or particle radiation, very low carbon footprint in their manufacturing process and use very small quantities of widely available elements as a source of fuel. So your article is biased towards the current obsolete model of central generating plants, transmission lines and distribution, certainly with “smart metering” to further control people. What scares most the big oil and big electric power monopolies is the independence and very low cost the new energy technologies afford people all over the world! The energy cartel has succeeded so far in preventing the introduction of these new technologies, but no one can blockade progress forever… From now on, free energy will inexorably take over! Please correct your article to reflect these trends. I agree, to an extent, but research frameworks have changed dramatically and are significantly accelerated over just 10 years ago. Materials science is incredibly productive and growing more so. I wish I knew precisely how far from being commercially feasible materials like this are. I don’t, but I have a strong feeling it’s years, not decades. How far away from commercial feasibility are large scale Molten Salt Reactors? Which technology would scale faster once feasibility is achieved? All of which argues powerfully in favor of a supergrid to allow sharing of energy resources over great distances. A renewable energy is much less expensive, if it is based on a supergrid. 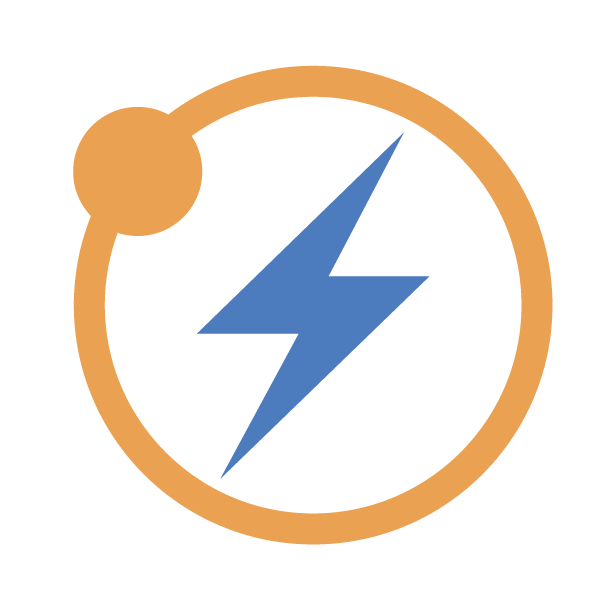 A supergrid greatly improves the efficiency of non-dispatchable generators (by reducing the need to shut them down at times) and reduces the need for energy storage. My piece of that is enabling technology for moving the future supergrid underground (www.elpipe.com). None of the listed energy technologies is acknowledged by mainstream science. At best, there may have been some unexplained, unrepeatable anomalies in lab experiements that have been optimistically attributed to these technologies by their capital-seeking promoters. 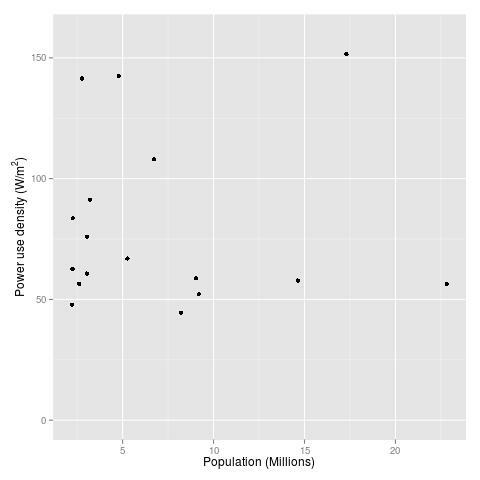 Your post gave me a different way of looking at power density and proves the point that the renewables won’t work in urban areas from decentralized. Agreed, intuition is rather vague. When I wish for LFTR, etc, I need to “know” just how hard it will be to actually deal with that highly radioactive process, not just wish it can be done easily on the global scale because advocates say so. I find that the SEGS (solar in California since the 80’s) is now producing electricity for less than 6 cents per kWh. From my reading of the article, this is not a carbon-negative energy source, or even an energy source at all. It is an electrically powered electrolysis cell that primarily makes hydrogen, and co-produces other chemicals that absorb CO2. Someone should tell Jim Baird about this; it might be most applicable to an OTEC hydrogen/ammonia production facility. Assuming some government placed a tax on carbon and allowed credit trading, such a facility could draw CO2 out of the ocean and mineralize it in order to sell CO2 emission credits. Like an OTEC that draws heat from the ocean, it might have to be mobile, since the ocean does not mix very rapidly and otherwise a depleted region around the plant would form. Of course, like much of the renewable vision, it only works if a large market for hydrogen or ammonia develops, and that market accepts a renewable product that costs more than the fossil fuel equivalent. Mr. Wilson’s arguments trivialize complexity so that they favour his perspective, and ignore many realities. He may be preaching to the echo chamber here on The Energy Collective, which seems to have become a bit of a Pro-Nuclear, Anti-Renewables Collective, but that doesn’t mean his argument holds any water. 1. Wind farms take up from less than one percent to a maximum of 2% of the land upon which they sit lightly. The rest of the land is available for whatever uses it had before, unless the land was used for competitive low-level pylon flying races which I suppose is possible. Farmers love wind turbines because they take up a quarter of an acre and provide $6,000 – $16,000 of annual revenue, which is up to 24 times the revenue per acre, substantially increasing the revenue of their land resource, which will often contain four or five revenue generating uses including crops, livestock, agritourism, food processing, cellular relay towers and, oh yes, wind turbines. In farm land of any type, wind farms take up <1% of the available land due to pre-existing roads and other infrastructure that can be reused. Ridge lines, a favoured spot for wind farms due to the land forms increasing air speed as it flows over the top fo the ridge, have a maximum of 2% of the land surface taken up by wind turbines and their infrastructure. How exactly does Mr. Wilson’s calculation fare when real density is taken into account? Well, wind energy is in exactly the same spot as nuclear. Funny that. – There is no social license for nuclear outside of a subset of nuclear plants where it already exists. On all of those points, renewables are much, much more attractive than nuclear. Social license is very positive, human resources are skilled trades who are numerous and often underemployed, financing is simple, regulatory approval is trivial, terrorists can get no benefit from renewables, decommissioning is easy, and renewables — excepting solar — are cheap to curtail. The land density argument is only made by nuclear advocates. It isn’t a factor in rational, economic decision-making. I wish the above weren’t true. Nuclear is at the same level as renewables in terms of fatalities per TWh, and almost as good from a C02 per MWh basis and like renewables emits no particulate pollution. It’s a good choice from an engineer’s perspective. It just isn’t a viable choice in the real world where people live. That’s why I don’t waste my time promoting it, but do spend a little time pointing out the inanity of attacks on renewables by nuclear-only advocates. 3. 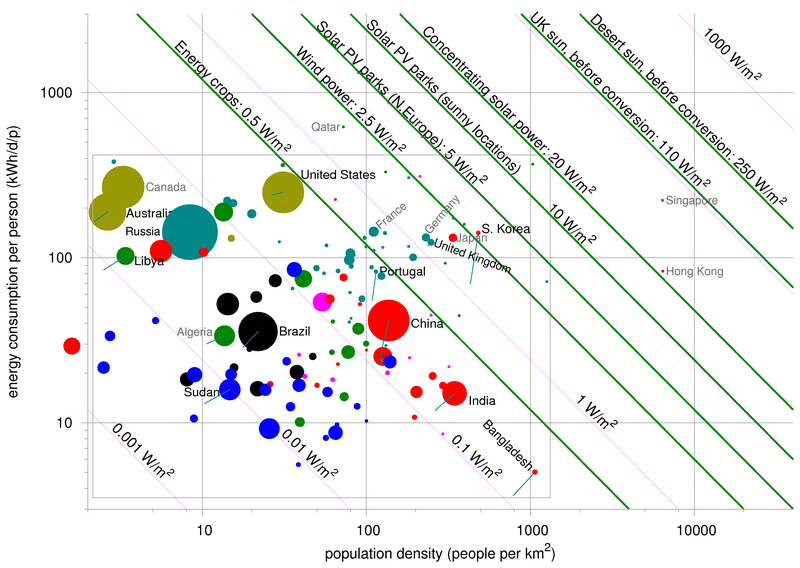 Finally, it’s worth looking at rapid urbanization a little less simplistically than Mr. Wilson does. There is peak urbanization that is sustainable. It’s in the range of 85-95%. Food must still be grown. Resources must still be extracted. Tourism will still be supported. A small subset of people will still choose to live in rural areas, arguably a smaller number than would like to. All of these rural dwellers typically have to cobble together multiple sources of income in order to keep afloat and increase their financial security. As the farmland example above shows, renewables provide another mechanism for that, with construction, leasing or tie-in revenue, maintenance jobs, secondary food and lodgings revenue, etc. Balancing wealth generation a little so that there is some reason for enough people to stay in rural areas is a good thing. Note that I did not say “never”, just “unlikely to happen”; I freely admit that the future is uncertain. And I was not talking about solar cells, but rather cheap batteries, which are required to make PV competitive with desert CSP and nuclear when used in a 100% non-fossil electrical system. Sure, in most developed nations, particularly those with strong fossil fuel industries, a nuclear growth spurt today is unlikely. But nuclear plants are being built in China by the dozens, at a cost of $2/Watt. At this cost, they may be able to make ammonia from nuclear electricity for a cost that is competitive with imported oil. If they accelerate their built rate, it is conceivable that in 20 years, they would be able to build more plants than their grid could hold (assuming they are not quick to decomission all of the shiny-new coal plants they are building). So if we were to pioneer the use of ammonia as transportation fuel (even if we in the US and UK make it from fossil fuel), it is likely that some nations (with low labor cost and poor fossil fuel resources) would be able to economically make it from domestic nuclear or renewable energy. Little change should be expected, regardless of who wins! Power in Brazil: what's the future? This post is an evaluation of the future of nuclear power when compared with renewables plus storage. A comprehensive energy efficiency strategy for a commercial building involves striking a delicate balance between cutting energy costs and maintaining tenant (client) satisfaction. Just like any other form of strategy, an energy efficiency..